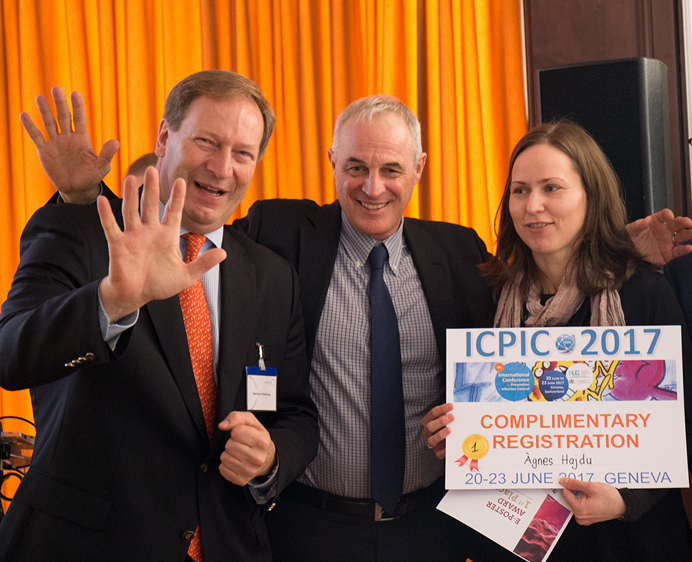 The ICPIC Conference (20-23 June, Geneva) is approaching rapidly. We are looking forward to meet initiator Prof. Didier Pittet, speakers and conference participants. But Bernhard Küenburg and me are also looking forward to meet those three young women, who were the winners of the poster presentation at the CEE Semmelweis Conference in March 2017 (Budapest), and who were invited there by Prof. Pittet to participate at ICPIC. In the following weeks we want to interview them about important hospital hygiene topics and their expectations regarding ICPIC. We begin today with Dr. Ágnes Hajdu from the Department of Hospital Epidemiology and Hygiene at the National Center for Epidemiology in Budapest. Ágnes, you are one of the three winners (most points) from the poster session at the Semmelweis Conference in March. Can you summary your work (“Epidemiological and microbiological aspects of Clostridium difficile infections in Hungary: results from the newly launched European surveillance”) in a few words? Clostridium difficile infections, especially those cases that are associated with health care, cause a significant public health burden in European countries. The European Centre for Disease Prevention and Control (ECDC) therefore coordinated the development of a common protocol to gather comparable data on CDI in European acute care hospitals. This protocol was published in the autumn of 2015, and ECDC launched a call for a one-month data collection in early 2016 using the common protocol. Hungary has participated in this endeavour, and my poster presents data from this one-month data collection. It has proved to be very useful for Hungary, as it complemented the pre-existing national notification data on healthcare-associated CDI with valuable information. E.g. data showed that the incidence of CDI varies significantly across hospital types, or that microbiological testing frequency is strongly correlated with CDI incidence. Also, a very strong dominance of one specific Clostridium difficile strain (so-called ribotype 027) was found, which indicate the need for strengthening infection control and possibly limit the use of fluoroquinolone antibiotics which typically lead to the „selection” of this type of Clostridium difficile in the gut. Will you present your poster in any form at ICPIC in June? Yes, the poster is now among the posters accepted for presentation at ICPIC. Is it the first time that you participate at ICPIC? Yes, it is! This is very exciting. I have attended other major European and US conferences before (ESCAIDE, ECCMID, IDWeek, SHEA Spring Conference), but never the ICPIC. Therefore, I am very much looking forward to it. Given that the focus of ICPIC is specifically on infection prevention, infection control and antimicrobial resistance, I expect to learn a tremendous amount about scientific achievements as well as best practices in these fields. Since I do not work in a hospital, but at national level, I am particularly interested in sessions related to surveillance, training, infection control evidence, large-scale actions to combat antimicrobial resistance, guideline implementation, and – of course – Clostridium difficile infections.